If only this were milk there would be no need to cry. Cleanup efforts are currently underway in four separate oil spills that have occurred in the last ten days. On March 27th, a train carrying Canadian tar sands dilbit jumped the rails in rural Minnesota spilling an estimated 30,000 gallons of black gold onto the countryside. Two days later a pipeline ruptured in the town of Mayflower, Arkansas, sending a river of Albertan tar sands crude gurgling down residential streets. And news is just breaking about a Shell oil spill that occurred the same day in Texas that dumped an estimated 700 barrels, including at least 60 barrels of oil into a waterway that leads to the Gulf of Mexico (stay tuned for more on that). This week a Canadian Pacific freight train loaded with oil derailed, spilling its cargo over the Northwest Ontario countryside. Originally reported as a leak of 600 liters, the CBC reported on Thursday that the estimated volume of the spill has increased to 63,000 liters. The accelerating expansion of Alberta’s tar sands has North America’s current pipeline infrastructure maxed out and, as a result, oil companies have been searching for an alternative way to move their product to market. As lobbying efforts around the stymied Keystone XL and Northern Gateway pipelines intensify, oil companies have been quietly loading their toxic cargo onto freight trains. Meanwhile the Canadian Pacific Railway’s crude oil volumes have skyrocketed from 2,800 carloads in 2010 to a staggering 53,000 last year. The company hopes to increase that number to over 70,000 this year. Most, if not all, advocates of pipeline transportation will argue that the growing use of rail transport emphasizes the urgent need for pipelines. Pipelines are commonly touted as a more reliable mode of fuel transport than rail. Pipelines, as the story goes, are safe. Unfortunately for pipeline proponents, last week’s pipeline rupture in Arkansas is no anomaly in the history of US pipelines. In fact, pipelines have made a pretty consistent mess throughout the States for the last 20 years. One thing has changed, however: those messes are getting more expensive to clean up. The U.S. Department of Transportation’s Pipeline & Hazardous Materials Safety Administration (PHMSA) is responsible for reporting and recording all “significant pipeline incidents” which are all incidents exceeding the cost of $50,000 (in 1984 dollars). In terms of property damage PHMSA records indicate that the 20-year average (1993-2012) cost of significant pipeline incidents is over 318 million dollars, the 10-year average (2003-2012) cost is over 494 million dollars the 5-year average (2008-2012) cost is over 545 million dollars and the 3-year average (2010-2012) cost is over 662 million dollars. The cost of cleaning up after pipelines just keeps getting more expensive. Over the last 20 years, pipeline incidents have caused over $6.3 billion in property damages. On average during this time period there were more than 250 pipeline incidents per year, without a single year where that number dropped below 220. During that time, more than 2.5 million barrels of hazardous liquids were spilled and little more than half of those spilled amounts were recovered in cleanup efforts. 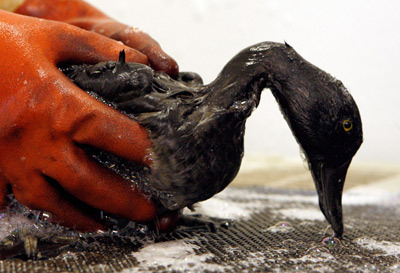 One of the factors contributing to the cost of cleanup is the introduction of Alberta’s diluted bitumen to southern markets (The most expensive year on record is 2010 when Enbridge spilled 3.3 million liters or 877,000 gallons of dilbit into Michigan’s Kalamazoo River). Companies eager to move Canadian dilbit south to refineries and export facilities have been jimmying an aging pipeline infrastructure to handle the more corrosive substance and there is currently no federal oversight to monitor this process. Pipeline Network by Petroleum GeoGraphics Corp. on NRP. Two decades of pipeline spills, mapped by the New York Times. ExxonMobil’s sixty-five-year-old Pegasus pipeline that ruptured last week was one such retrofitted line. Built in the late 1940s, the old winged horse of a pipeline was reversed in 2006 in order to carry Canadian dilbit to the Gulf Coast via Illinois at a 50 percent increased capacity. The burst line sent a river of at least 84,000 gallons of dilbit running down residential streets in Mayflower and into nearby wetlands. The exact cause of the pipeline rupture is still unknown. Many of the major pipeline operators – like Exxon, Enbridge and TransCanada – have been cited for lax inspections, shoddy emergency preparedness, and ineffective spill management and response. Both Exxon and Enbridge have been told their actions in the immediate hours after pipeline ruptures have made spills worse than necessary. Debbie Hersman with the National Transportation Safety Board told NPR, “100 percent of the accidents that we’ve investigated were completely preventable.” In many cases companies performed inspections and discovered cracks and corrosion in the line but did not perform repairs before accidents occurred. Yet even a cursory glance at the history of pipeline accidents in the US shows what is happening in Arkansas is no ‘hiccup’ and will bear no ‘short-term’ consequences. At least, not for the residents of Mayflower.